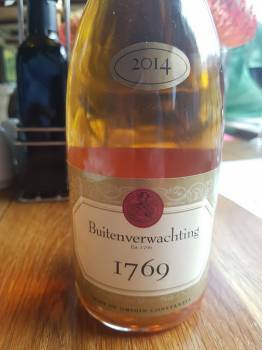 The 1769 is Buitenverwachting’s answer to Vin de Constance from nearby Klein Constantia, a sweet wine from Muscat de Frontignan. Winemaker Brad Paton explains that he ferments on skins, maturation for the current-release 2014 lasting 10 months in 225-litre barrels, 5% new. On the nose, some citrus blossom before orange, apricot, caramel and some spice. The palate has great depth of flavour, oily texture and soft but sufficient acidity – unctuous in the best sense. Price: R150 per 500ml bottle.